India might edge out New Zealand due to their all-round spin attack which suits the West Indian pitches. The first standalone Women’s World Twenty20 is set to begin on November 9th with India taking on New Zealand in the opening game. India, the runners-up of last year’s World Cup, are more formidable in the T20I format than the other teams. However, their bowling attack could turn out to be the trump card in this tournament, hosted by the Caribbean. New Zealand, on the other hand, have a couple of proven Twenty20 superstars in their side. India will have a selection headache ahead of this tournament opener. Pooja Vastrakar left the field during the warm-up game against Windies. Mansi Joshi could play alongside Arundhati Reddy if Vastrakar doesn’t get fit. India might prefer Radha Yadav ahead of the experienced Ekta Bisht if performances in the warm-up games are taken into consideration. Anuja Patil is likely to start ahead of another all-rounder Deepti Sharma given her ability to score quickly. The first match of the Women’s World T20 will be played between India and New Zealand at Providence Stadium in Guyana. The match starts at 11:00 AM local time (3:00 PM GMT) (8:30 PM IST). India: W, W, W, W, W.
New Zealand: L, L, L, L, L.
The Caribbean Islands are easily the toughest conditions for the batters in women’s cricket. The warm-up matches and the recent T20I series between South Africa and Windies do prove the same. The CPL matches this year at Providence Stadium had an average score around 150. With two more matches to be played at this venue on the first day of the tournament, the game between India and New Zealand could well witness a decent scoring game. Harmanpreet Kaur (C), Smriti Mandhana, Mithali Raj, Jemimah Rodrigues, Veda Krishnamurthy, Taniya Bhatia, Deepti Sharma/Anuja Patil, Poonam Yadav, Radha Yadav, Mansi Joshi/Pooja Vastrakar, Arundhati Reddy. Amy Satterthwaite (C), Suzie Bates, Sophie Devine, Maddy Green, Katey Martin, Bernadine Bezuidenhout, Holly Huddleston/Hayley Jensen, Leigh Kasperek, Amelia Kerr, Lea Tahuhu, Jess Watkin. Teenage sensation Jemimah Rodrigues can make the difference to the Indian batting line-up with her ability to utilise the overs in the powerplay. Leigh Kasperek and Poonam Yadav’s consistency at taking wickets in this format makes them crucial pickings. Katey Martin has the ability to play the big shots and accelerate when required. Taniya Bhatia, Harmanpreet Kaur, Smriti Mandhana, Jemimah Rodrigues, Suzie Bates, Sophie Devine, Anuja Patil, Poonam Yadav, Arundhati Reddy, Leigh Kasperek, Amelia Kerr. Sophie Devine is an ideal choice as captain given her dual role. She often opens the batting and also is team’s strike bowler. The choice of vice-captain can be made between Harmanpreet, Bates, Kasperek, Anuja and Poonam Yadav. Mandhana and Jemimah can also be considered for a multiplier role depending upon the expected conditions. 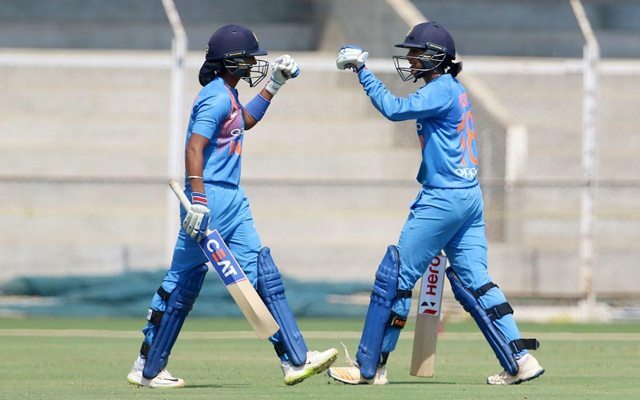 Due to high price tags, the best possibility is taking a gamble of picking only three among Harmanpreet, Mandhana, Bates, Mithali and Satterthwaite. Bates and Kaur should be sure shot as they provide an option in bowling for their teams. Though Mithali doesn’t score at a brisk pace, she can assure a score of 30-40. Mandhana, on the other hand, hasn’t managed to crack the T20I format as she has done in the ODIs and the T20 leagues.